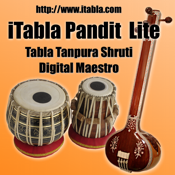 iTabla Pandit is the smallest and most realistic Digital Tabla, Tanpura and Shruti Maestro. With it, you don't need anymore your electronic tabla or tanpura. It will become your favorite accompaniment tool of your musical practice and your concerts of Hindustani and Carnatic Indian Music, creating a wonderful atmosphere. NOTICE: With iTabla Pandit Lite version, you'll be able to discover all the capabilities and qualities of our "iTabla Pandit" before buying it. The "Lite" version will stop the sound nearly every minute as its purpose is just for demonstration. Several high quality and perfectly tuned tampura sound samples are provided within iTabla Pandit. You can use them in ANY PITCH by changing the key. ◊ Important : our software is compatible with iOS 3.0, so you'll be able to use it even on your "old" device!